Don't worry: That highly realistic skeleton and the life-size model of the partially eviscerated girl are there to help you. Though these anatomical displays are more visually striking than the hundreds of pamphlets, books and videos that line the walls of the Frymoyer Community Health Resource Center, they have an identical purpose: to provide free information about health and medicine to the public. The center formerly occupied a closet; now, it boasts spacious, welcoming quarters just behind the main reception desk at Burlington's Fletcher Allen Health Care. Medical librarian Alan Lampson, who oversees the Frymoyer center, is a modest, genial fellow who stops short of stating that the increase in square footage reflects the growing importance of his office. But a theme throughout his conversation with Seven Days is the chief dilemma of the internet age: assessing the worth and accuracy of all that information out there. And when it comes to health care, accuracy can sometimes mean the difference between life and death. Lampson, 54, received his master's in library science at the University at Albany, SUNY, and like many librarians functions both as gatekeeper and community liaison. He performs several valuable — yet free — public services for residents of northern Vermont and northern New York. Now in his 12th year at his current position, Lampson fields questions daily about medications, treatment programs and social services. 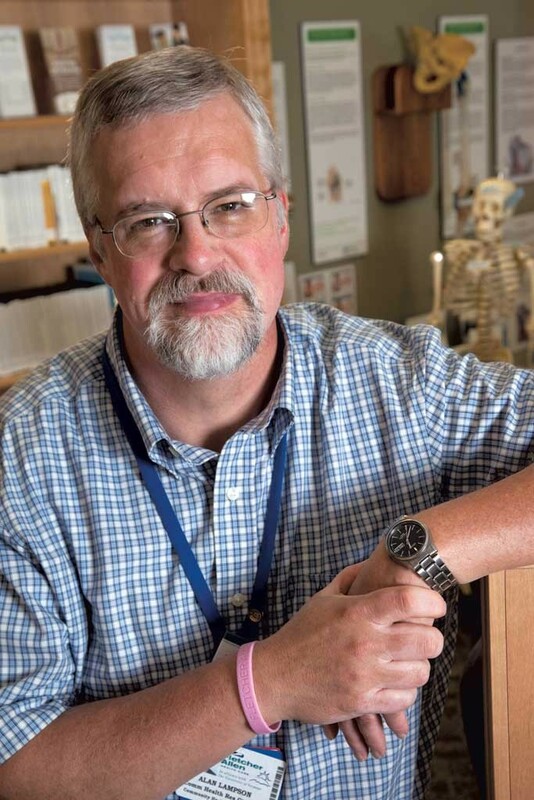 Along with health educator Kristine Buck, he also oversees a large lending library of health care materials ranging from textbooks to plastic skeletons. Though the Frymoyer center wins the occasional grant, it gets most of its funding from Fletcher Allen's general budget. Lampson recently shared his perspective from the front lines of the health care industry. SEVEN DAYS: What exactly is a medical librarian? ALAN LAMPSON: Librarians who have chosen as their field of study medical settings. Some medical librarians work in medical school libraries; some work in hospital libraries, working with staff or students. Consumer health librarians work specifically with patients and members of the community. SD: When people visit or call, what kinds of questions do they usually ask? AL: People come to us looking for information on healthy living, eating well, exercise programs. Or they've been diagnosed with a specific condition and they're looking for treatment options and medications that are available. We get questions on a wide variety of topics: people looking for the forms needed to do an advance directive for their health care proxy, looking for social service agencies and support groups for different conditions. SD: Why are your office's services important? AL: In the current medical system, there's a lot more responsibility put on the patients, and there are so many more treatments available. It's more important than ever that the patient be involved in the decision making about which treatment to follow. In the current medical dynamic, patients are supposed to be involved. In order to be involved, they need to be knowledgeable. SD: How do patients use the nontraditional resources you have here? AL: People are very visual. Someone might want to see, for instance, what actually happens during a knee-replacement surgery. We do have a flip chart, but we also know [about] videos online where people can actually watch the surgery. SD: Vermont has a small, widely dispersed population. Does that make your job more difficult? AL: [Vermont does not] have the level of support groups that a more urbanized area would have. Most support groups are run by volunteer citizens who have a condition and are interested in it, and there aren't a lot of them. People are really looking for that kind of support, which the traditional medical system doesn't give — peer support. SD: Do you get a lot of questions about health insurance? AL: Yes, we do get calls from people trying to navigate the health care system. CHI [Fletcher Allen's Community Health Improvement Office] has health care navigators, and, last fall, we had materials here that outlined the different plans available. We also get a lot of calls asking "How do I find a specialist? My primary care doctor said I should go to this specialist — are there others? Why should I go to that one? How do I get a second opinion?" People are afraid to talk to their doctors about getting a second opinion; they think they'll personally offend the doctor. We tell people that if your doctor is offended by your asking for a second opinion, that's not a good sign. We tell people they should be able to get a second opinion, and it might not even be someone at Fletcher Allen. SD: You've been fielding medical questions for a long time. Have you noticed any trends? AL: We do not get as many questions as we used to about weight-loss surgery. I don't know if people are having fewer [such surgeries], or if they know more about them now. We also get a lot of questions about orthopedic surgery. Baby boomers, as they're aging, need a lot of joint replacements. We get many more questions from people in middle to older age, because they have more health issues. But we do see that young people are more interested in prevention-type stuff: nutrition, organic eating, healthy recipes, physical activity, like "How do I get ready for a 5K?" Hopefully, as these people age, there'll be fewer services needed at the other end. Work is a monthly interview feature showcasing a Vermonter with an interesting occupation. Suggest a job you would like to know more about: pamela@sevendaysvt.com. The original print version of this article was headlined "Rx Resource"